Are You Cut Out for Rotary? Have you wondered how you can give back, have a more meaningful connection to your community and make lifelong friends with others with a giving spirit? Our club is continuously looking to grow our membership with other community minded leaders. Our weekly meetings are held on Wednesdays at 12:10pm at Youche Country Club in Crown Point. You are welcome to to join us as a guest at our weekly meetings to determine if our club may be a good fit for you. About Rotary... We volunteer (Jack Barber's Shoes for Kids, Roatán Library & Scholarships, Brews, Blues & BBQ, Rebuilding Together, Hope Tree, Service Projects, Literacy Initiatives, etc.) but we also build meaningful relationships with community leaders, provide leadership development, and other personal and professional benefits such as hearing regularly from great speakers. A good Rotarian will attend as many of our meetings as possible. When traveling you may pick up a "make up" from another club. Attendance is important but it doesn't have to be at your home club! Our members pay quarterly dues. Our dues include lunch, district and international dues as well as a contribution to Rotary International. Rotary International is by far the largest service club in the world with 1.2 million Rotarians, 32,000 clubs in more than 200 countries and geographical areas. It is interesting and fun, when traveling, to attend a local club's meeting. Rotarians and their guests are always welcome at any meeting anywhere in the world. It's neat to hear about other clubs projects and how they raise money to fund them. Who are Rotary's members? The movers and shakers in our communities. Our club gives you an opportunity to join leaders to take action on important issues affecting our community, our nation, and the world. We also have a lot of fun — whether we’re socializing or working together on service projects. Members of our Rotary club connect at weekly meetings and learn from business experts, political and civic leaders, and entrepreneurs, who help us stay informed on topics that are relevant to our community. Together, we are make great things happen. We have a structure that focuses on action and positive results. 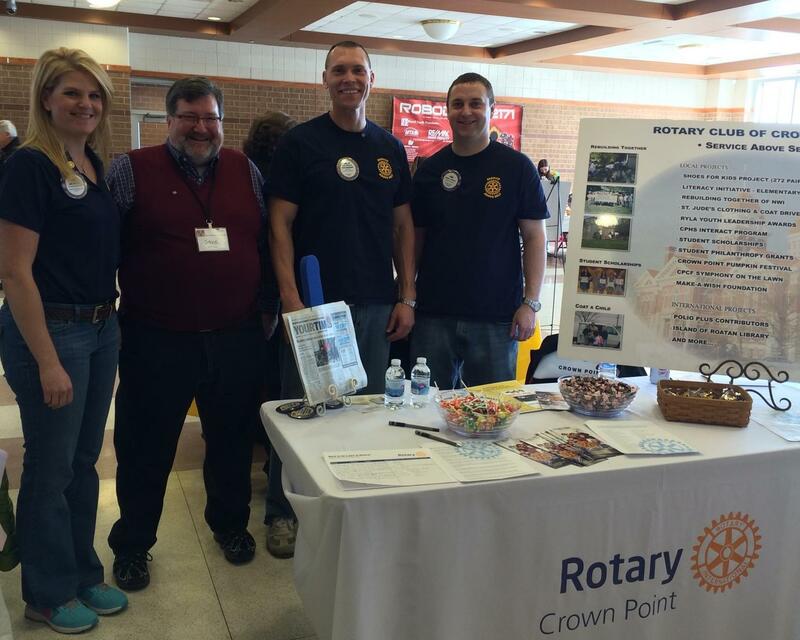 While considering membership in our club please take some time to visit www.rotary.org and www.crownpointrotary.org to learn more about us. Please don't hesitate to contact us via email if you have any questions or would like to join us as a guest at one of our weekly meetings.